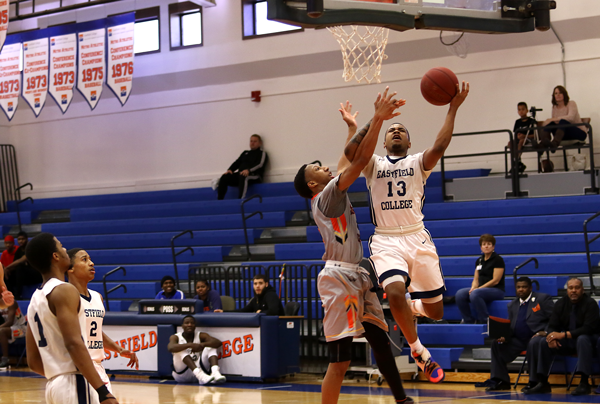 The Eastfield men’s basketball team leads conference with a 4-1 record halfway through the regular season, hoping to hold onto the top spot for a conference title. Coach Anthony Fletcher said conference play has been highly competitive so far. Eastfield started conference with a 95-91 win over Richland (2-3) and a 71-67 road win at Mountain View (2-3). Their only loss came against Cedar Valley (1-4). Fletcher said the 97-94 loss to the lowest ranking conference team was due to a lack of “major urgency,” one reminiscent to last year’s first-round tournament loss to Brookhaven. Sophomore guard J.J. Murray, who leads the team with 20.6 points per game, said that loss to the Suns was due to a lack of focus. The loss was followed by a blowout 101-85 away win at North Lake (3-2) and a 91-83 home win over Brookhaven (3-2). Fletcher said the loss was only a minor setback so far and said if the team can get four more wins this conference season, they can claim the regular season title. The No. 8-ranked Harvesters are No. 3 in the nation in points per game (100.9) and No. 4 in field goals made per game (36.4). With three true freshmen starters, guards Rashaun Coleman and DaJuan Ridgeway and forward Michael Fuller, Fletcher said this is one of the youngest teams he’s coached. Eastfield’s second half of conference continues Saturday with a game at Richland.